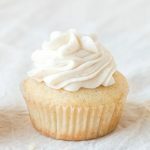 The amount of buttercream in the recipe is enough to frost 16-24 cupcakes, depending on how generous you are with the frosting. For a 9-inch layer cake, multiply the recipe by 1½. In the bowl of an electric mixer fitted with the paddle attachment, beat butter and salt on medium speed until smooth and creamy, about 2 minutes. Add 2 cups powdered sugar and beat until combined, then add another 2 cups, and beat until completely smooth. Add cream, vanilla, and lemon juice and beat on high speed for 2 minutes until fluffy. Beat in more sugar as needed, until desired consistency (thick enough to pipe). *Salt and lemon juice are added to cut sweetness and are optional. Depending on your personal taste, you can add more or leave out entirely.